In May I did an interview about my grandfather with Dan Riendeau of News Talk 770 CHQR in Calgary. He hung onto the interview for Remembrance Day took the time to include sections of Doc Alexander’s journals, read by colleague, along with sound effects. It’s nearly 20 minutes long and a great listen, aside from the ill-prepared interviewee . . . (that would be me; I didn’t have my facts and figures at hand and had to by memory). But I think it came out well nonetheless. And my thanks to Dan for a great Remembrance Day piece. Aug. 20 — Notified today that we will not be sailing for awhile, but on Tuesday will start another seven days of leave. We were not pleased with this at all but can do nothing about it. July 29 — Am up and dressed. After lunch will return to Apeldoorn. Tomorrow I hope to start the trail for home. Arrived back in Apeldoorn in time for dinner, got packed and ready and went to bed. July 30 — Up early — Gordie drove me first over to Army to see Timmy Cameron and then to Report Depot. I am registered and am in Draft 250. On Wednesday night we will start for England. Expect the three Wilbers kiddies up to see me tomorrow. Tonight, the three of us, Hayes from Red Deer, Greenwood from McLeod and myself went to No. 1 Gen. Hosp. to spend the evening with Dewer, Mason and Archer. July 31 — Went down to the station and met Joep, Get and Johnnie and we spent the day in Nijmegen. I enjoyed it so much — but really hate to say goodbye to those kiddies and hate to think of them growing up in Europe — especially the girls who do not have the same or anywhere near the same privileges as our Canadian girls. Tonight we have all worked hard sewing on campaign ribbons. Not too good, but they will stick. Expected to leave tomorrow night — but out trip has been postponed for 48 hours. June 8 — N/S (nursing sisters) Rideout and Purley left this morning. The bunch is gradually getting smaller all the time. Today, Gordie, Staff Sgt. Howell, N/S Smith and Stover and I took a trip Aurich and Emden. Thousands of German soldiers along the roads — the Army returning from Holland. Have just had a tooth pulled, so do not feel very spry. June 9 — Court martial proceeding against Pte Raven, for armed robbery. An awful nuisance at this time. Notified this morning that all Nursing Sisters would report to 21 FDS at once. N/S Rideout and Purley are on leave, so there are only two left to report. it is a Russian Camp which I do not think is fit for any Canadian girls to be in, so had them wait until I went to Corps, no luck. June 10 — Tiny Stover and Ruth Smith left today. They will only be there four days and are then flying to England on leave. I have advised both to report to CMHQ and get posted in England. Our first Burma draft leaves in the morning. Sgt. McCosham, Pte. Bowles, Sibley, Farmer, Joncas and Gamley. A new captain is being posted to us — and I suppose will replace one of the old ones. Our new officer — Capt. Greene arrived today. 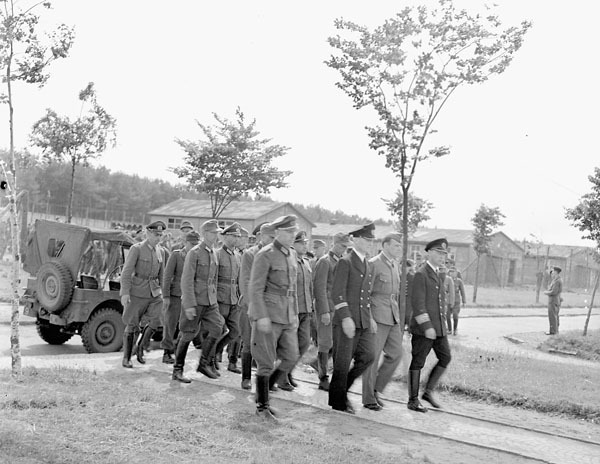 Demobilization of high-ranking German officers and officials at an internment camp, Esterwegen, Netherlands, 8 June 1945. LAC. June 2 — Big inspection Oldenburg by Gen. Simmons went off very well too. In the afternoon Col. Barrett from Corps came over and presented us with four bottles of liquor and a box of chocolates for the nurses. In the evening, Archie Hardyment, Ruth Smith, Tiny and I went in to Oldenburg to a Canadian show. June 3 — Church parade. Dave McKenzie returned from Turnhout. Ronnie was supposed to come back but did not show up. Col. Barritt, Paul Laird and George Currie were over and spent the evening with us. We expect to move back to Holland in a few days time. It can not come too quickly either. June 4 — Usual day, busy on reports all day. Ronnie arrived back from Holland tonight. Picture show in our cinema. Time is dragging quite a lot. June 6 — Hospital closed today. Everything handed over to 6th Gen. Hosp. Our work as a Medical Unit is finished. June 7 — Canadian show in our theatre. After the show we entered the Actors and Actresses in our Mess at our farewell Unit party. General H.D.G. 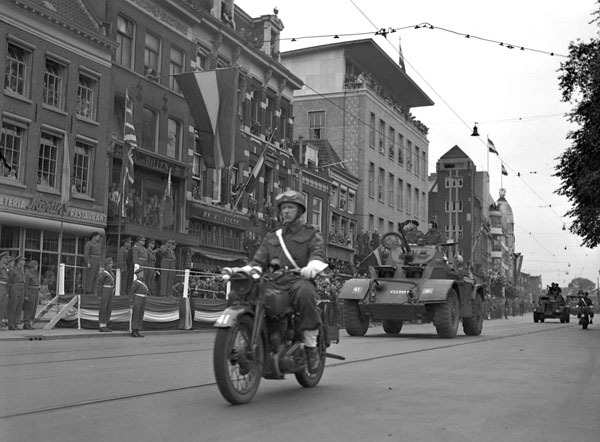 Crerar taking the salute at a parade of the 3rd Canadian Infantry Division on the first anniversary of D-Day, Utrecht, Netherlands, 6 June 1945. LAC. May 26 — We left Zielst at 9:30 A.M. and arrived at Army H.Q., Hengelo at about 2 P.M., but did not get away from there until 9 P.M. so did not arrive back home until the middle of the night. May 27 — Had a very bad cold, but was very busy so could not go to bed. Our first draft of eighteen men for the Army of Occupation arrived. No. 10 F.S.U. and three nurses were called away. Gunner H.E. 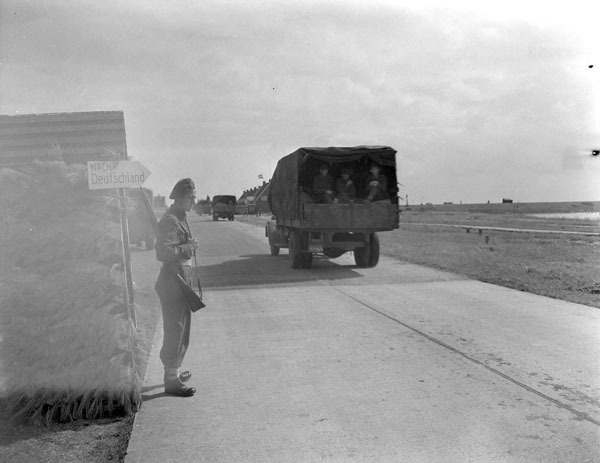 Robertson on guard duty as a convoy of German vehicles crosses the Zuiderzee causeway en route to Germany. Netherlands, 27 May 1945. LAC. May 21 — Wet and chilly. The same uninteresting day. Maj. Kitchen from 2CCS (Casualty Clearing Station) in for lunch. Tony arrived back at us tonight after an absence of five months. May 23 — Ordered to report at Amry H.Q. in Hegelo, Holland. Left BAd Zwischenahn at 8:30 and came by Leer, Meppen, Lingen, in Germany, crossed the border into Holland and reported to Army in Hengelo. Had a talk with Brig. Elder then started for Zielst until Sunday, when I must report to Army again. Drove to Arnhem, Nijmegen, ‘s-Hertogenbosch, Eindhoven and arrived at Zielst at 6 P.M. All the family were home excepting Get who was away at school at Reusel, so we drove over and got her. We all had a party here that night. General H.D.G. 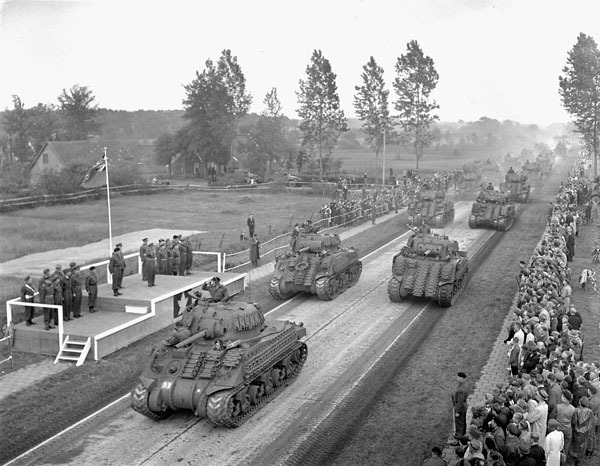 Crerar taking the salute during a mounted marchpast of The British Columbia Dragoons, Eelde, Netherlands, 23 May 1945. LAC. 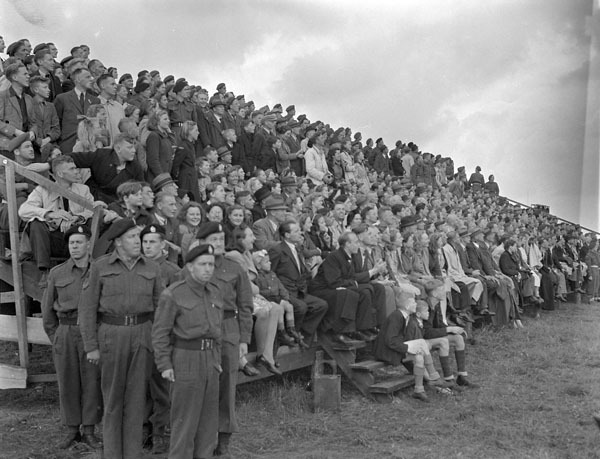 Dutch civilians watching an inspection and marchpast of the 5th Canadian Armoured Division, Eelde, Netherlands, 23 May 1945. LAC.